Dawn patrol on Powderhouse Peak provides amazing views of the morning sun blanketing the Sierra. A telemark skier drops the knee into fresh powder on Powderhouse Peak. Mileage can vary based on the route of the skin track. The climb begins immediately from the car, gaining more than 1,800 feet to the summit. Unless you have prior experience and proper equipment to take your dog in the backcountry, it is not recommended. Waterhouse and Powderhouse peaks are icons in the Tahoe backcountry scene for the ease of access, steep gladed descents, and relative avalanche safety. Whether accomplished as a dawn patrol outing before your desk job or lapped on endless powder days, these two peaks offer challenging terrain for all backcountry skiers and riders. 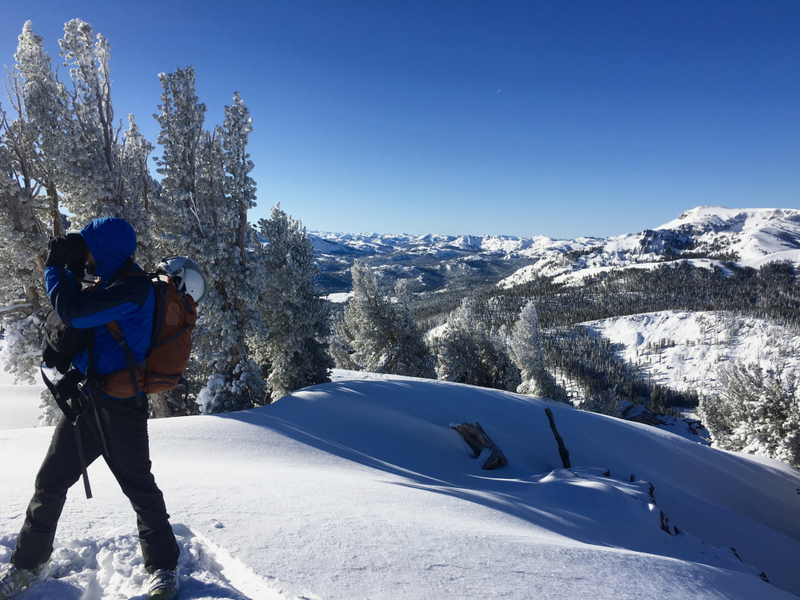 Waterhouse Peak offers more vertical feet with more mellow terrain, while Powderhouse peak offers steep gullies, open trees, and short cliff sections. Familiarity with the terrain is a must on Powderhouse to avoid any potential mandatory air situations. Finally, although a safer bet when avalanche conditions rise, Waterhouse and Powderhouse should never be considered 100% avalanche safe. Perched at the top of Luther Pass, a short drive south of Meyers, CA, the Waterhouse/Powderhouse ridgleline runs a near perfect east-west line, meaning the old-growth fir, whitebark pine, and hemlock glades blanketing the mountain hold legendary north-facing cold powder for days after a storm. The 7,700’ base of the approach also means that Waterhouse/Powderhouse is a sure bet for snow when it’s raining in town. When driving from South Lake Tahoe, the pullout for Powderhouse Peak appears immediately on your right as the Highway 89 tops out on Luther Pass. From the pull out, the skin track can’t be missed as it aims directly up the mountain for a 1,650’ climb. Once upon the summit, multiple descent options exist. Traversing to skier’s right will lead to Powderhouse’s steep, rocky bowl, which is to be avoided during avalanche conditions. Skiing fall-line straight back to the car is always a good option, that provides steeper sections of tree runs and a few natural gullies. Traversing skier’s left can sometimes offer a bit more untouched powder, but also requires a flat traverse back to the car. Parking for Waterhouse Peak can be found in a pullout on the right, just as Highway 89 descends down to Hope Valley. Follow the skin track up the looker’s left shoulder of the mountain as it mostly follows the ridgeline to the summit. The descent from Waterhouse is pretty simple, with all north-facing routes leading back to the huge meadow at the base of the mountain. Enjoy wide open old-growth trees and untouched cold powder the entire way down. Waterhouse and Powderhouse Peak offer a little something for skiers and riders of all backcountry ability levels (skiers and riders must still be proficient). Typically low avalanche concerns mean that these peaks are often a safer bet than other terrain in Tahoe. Due to its low avalanche danger and ease of access, these two peaks can see heavy use. There are still plenty of fresh tracks to be had as long as everyone respects each other and the mountain. In short, be properly trained for avalanche scenarios and practice proper backcountry etiquette, especially with regard to the skin track. From South Lake Tahoe, take Highway 50 west as if driving to Sacramento. In Meyers, CA turn left on Highway 89 south toward Markleeville. Continue on Highway 89 for approximately 7 miles. Parking will be available in turnouts on the righthand side of the highway. Please respect all no parking signs and all snow removal operations. Refer to current avalanche conditions by checking the daily forecast provided by Sierra Avalanche Center.